I did this walk on Sunday 27th November 2011, some five months since I had last walked along the Grand Union Canal towpath. I did this walk with Greg and we met up at Leighton Buzzard before taking one of the cars over to Aylesbury for the start of the walk. I had been going to do this walk anyway but this was a far simpler arrangement than taking a train up to Aylesbury and then heading back from Leighton Buzzard which is on a different line and would have meant the purchase of two single tickets. We parked in the Walton Street car park, which is free on Sundays from where it was just a short walk across Walton Street to the start of the canal. The Aylesbury Arm of the Grand Union Canal opened in 1815 and was in use commercial use until the 1960's. 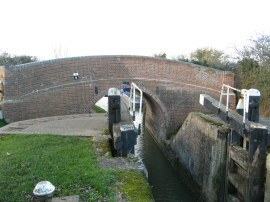 The arm rises 95 feet over the course of its 6.2 miles from Aylesbury to Marsworth Junction and has 16 locks. Unlike the Wendover Arm the Aylesbury Arm is still navigable, although there was one section closed for repairs when we walked by. 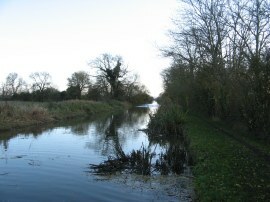 The canal takes a fairly straight course to Marsworth Junction and does not pass through any villages on the way. 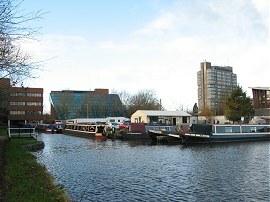 From Aylesbury Basin, photo 1, the towpath heads under a footbridge which is numbered bridge 19, as the canal starts making its way out of town. The locks are numbered from the Marsworth end and the first lock encountered on this walk was lock 16, Hills Partridge Lock, photo 2, followed a short distance further on by lock 15, Osier Bed Lock. 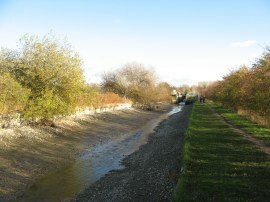 The canal leaves the town behind surprisingly quickly as it heads out across the open fields that the route of the canal crosses for most of its length. 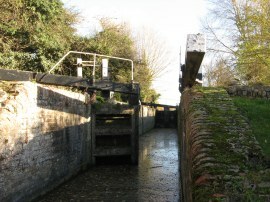 The locks on the Aylesbury Arm are quite narrow at only seven feet wide and each had two small lock gates at the Aylesbury end and one larger gate at the Marsworth End and Lock 14, Broughton Lock, photo 4, is typical of these. 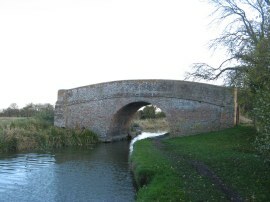 The canal is also crossed by a number of attractive brick bridges such as bridge 11, photo 5. Some of these are used for minor roads while others just connect the surrounding farmland. 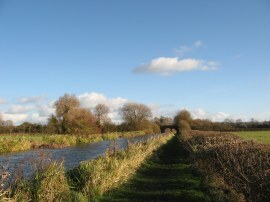 The canal route is quite straight for much of its length and the towpath mainly lined with hedges, photo 6, with a good towpath running alongside. I don't know whether it is an illusion due to the narrow width of the locks, photo 7, but they all seemed to be quite deep. 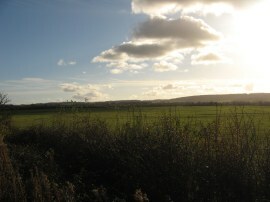 Away to our right we could see the Chiltern Hills, photo 8, rising up above the surrounding farmland with the Wendover Arm of the canal that I had walked back in June hidden below them. The day had started quite gloomy and I had passed through a very heavy band of rain on the way over to Leighton Buzzard but as the day progressed the skies soon began clearing allowing the low winter sun to light up the landscape, photo 9. 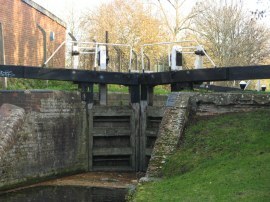 At bridge number 7, by Puttenham Bottom Lock, the Aylesbury Ring crosses over the canal on its 31 mile route round the town. This is another path I would really like to walk and have often wondered whether I would be able to walk it in one go, it is not that much further than the Tunbridge Well Circular but those extra miles could make all the difference! 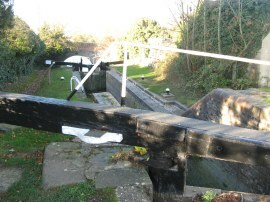 Some of the locks on the canal are quite leaky and the downstream gates are left open to prevent water loss, as at Jefferies Lock, photo 10. Between locks 6 and 5 the canal had been drained, photo 11; This seemed to be due to works taking place on lock 5. Earlier on we had also passed a sign about dredging works taking place although this usually requires a water supply. 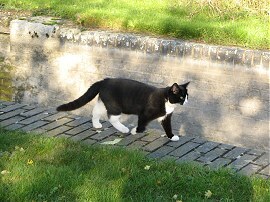 By Marsworth Lock number 3 we met up with a very friendly cat which had a good nuzzle around my feet before heading off to walk dangerously close to the lock edge, photo 12. 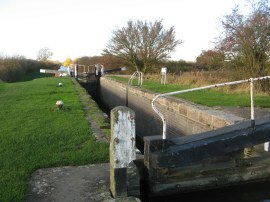 A short distance further on the route heads under bridge 1 and reaches the Marsworth Locks, 2 and 1. These are the only example of a staircase lock on the canal where the middle gate is links the top and bottom locks; unfortunately my photo 13 doesn't really do it justice. 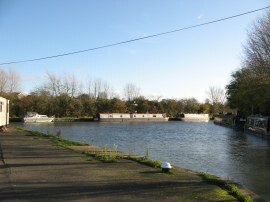 On the other side of the locks is Marsworth Junction, photo 14, where the Aylesbury Arm of the Grand Union Canal joins the main canal. The GPS made this stage 6.21 miles long. This had been a very straightforward walk with little of particular note on the route although the path itself through the countryside had been pleasant enough. 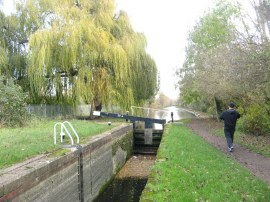 Having completed this stage we then walked up the main arm of the canal to Leighton Buzzard. As usual I have uploaded the route of the walk which can be accessed here: Grand Canal Stage 8 Route.